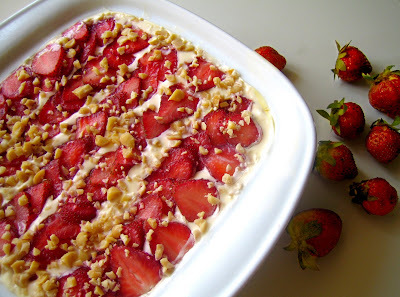 Since it’s my sister’s birthday today, I decided to post my recipe for Strawberry Sans rival as my gift to her. Actually not everyone knows that strawberry is my favorite fruit! I only eat most of this fruit during Christmas. Surprisingly last summer I went to La Trinidad, Benguet and brought home lots of strawberries. When I came home, I gathered all the ingredients for my new concoction. The challenge on my part then was to come up with something that will not use oven. So what I am going to share here now is more like of a refrigerator cake but very sans rival when it comes to taste and surprisingly the result is very good. So fold your sleeves and wear your apron because we’re going to do a lot of whisking here. All purpose cream, Jelly powder, butter, vanilla syrup, egg yolk, sugar, cashew nuts, pistachio nuts, graham cracker and strawberries. Get a huge bowl and mix cream, vanilla syrup, egg yolk, and diluted jelly all together. Melt the butter and add it also to the mixture. Prepare a rectangular ceramic then arrange graham crackers. 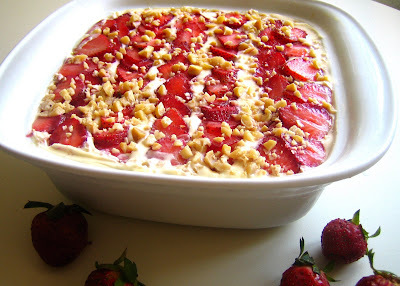 Fold the mixture per layer then add some sliced strawberries, minced cashew nuts and pistachios per layer. Not too much because on the last layer that will be the right time for you to place generous amount of strawberries, pistachios and cashew nuts. Place it in your freezer if you want it frozen or in your fridge when you want it normal. Then it's ready!